Rubbermaid Commercial Web Foot Wet Mop, Orange, Medium, Looped End, Cotton/Synthetic Blend - six wet mop heads. Antimicrobial protection on launderable wet mop inhibits the growth of bacteria that causes odors & stains. Balanced blend of cotton and synthetic fibers delivers up to five times the absorbency of cotton mops, while looped-end, open-twist yarn reduces linting. Tailband allows the mop to cover more floor area per stroke, saving time and money. Head Type: Wet Mop; Application: Floor Maintenance; Mop Head Style: Looped End; Mop Head Size: Medium. Includes six wet mop heads. Antimicrobial protection inhibits the growth of bacteria that cause odors and stains. Balanced blend of cotton and synthetic fibers is up to five times the absorbency of cotton mops. Looped-end, open-twist yarn reduces linting. If you have any questions about this product by Rubbermaid Commercial, contact us by completing and submitting the form below. If you are looking for a specif part number, please include it with your message. 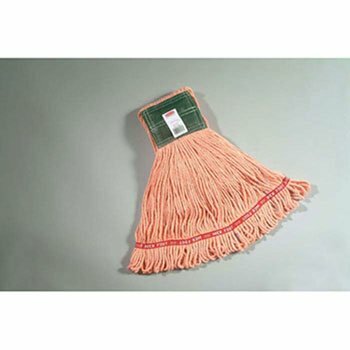 UNISAN Super Loop Wet Mop Heads, Cotton/Synthetic, Large Size, Orange - 12 mop heads.